Outbreaks tend to start overseas and are brought to the U.S., experts say. Washington state epidemiologist Dr. Scott Lindquist said that so-called 'patient zero' in the ongoing outbreak was someone who was visiting the U.S. from outside the country, according to ABC News radio affiliate KOMO Radio. "There was a large group of kids that were exposed to a visitor from outside the country that developed measles, and then what quickly happened is all those kids who were unimmunized actually went to public places like Ikea and Costco and the Portland Trailblazers game and they then spread it to anyone in the population that was unimmunized," Lindquist said in the KOMO Radio interview. Few further details have been released about that specific individual, including his or her age or what country the person had traveled from before arriving in Washington. Lindquist did say that health officials "have a good sense of who was the first case." A spokesperson for the Washington state Department of Health confirmed to ABC News that the strain in Washington's outbreak matches the strain that is involved in an ongoing outbreak in Eastern Europe. 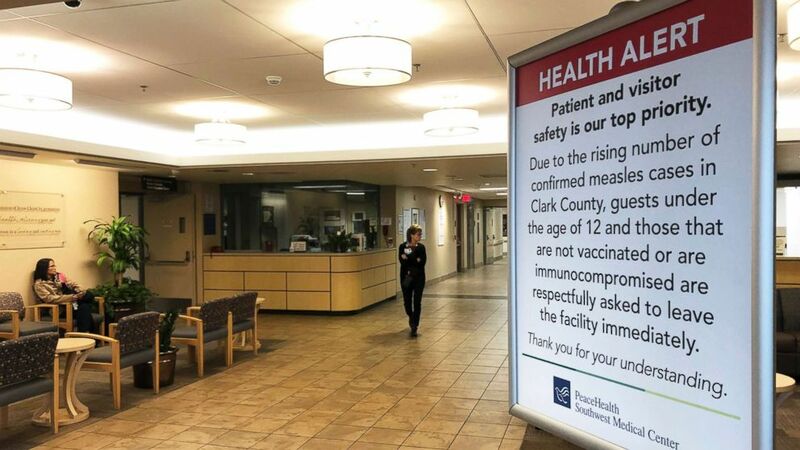 (Gillian Flaccus/AP) A sign prohibiting all children under 12 and unvaccinated adults stands at the entrance to PeaceHealth Southwest Medical Center in Vancouver, Wash., Jan. 25, 2019. "This is consistent with testing from the first known case, (a child) from this outbreak" in Washington, the spokesperson said in an email to ABC News. "Importation of the virus is the common way it shows up in the U.S. We’ve had very successful vaccination to rid the US from the virus, but in some areas of the world there are still frequent outbreaks due to low vaccination coverage." Most of the time we don't have indigenous transition of measles [in the U.S.
Daniel Salmon, the director of the Institute of Vaccine Safety at Johns Hopkins University, told ABC News that the involvement of a foreign individual or an American who recently traveled to a foreign country is "typically" how measles outbreaks start in the U.S.
"Most of the time we don't have indigenous transition of measles" in the U.S., Salmon said. 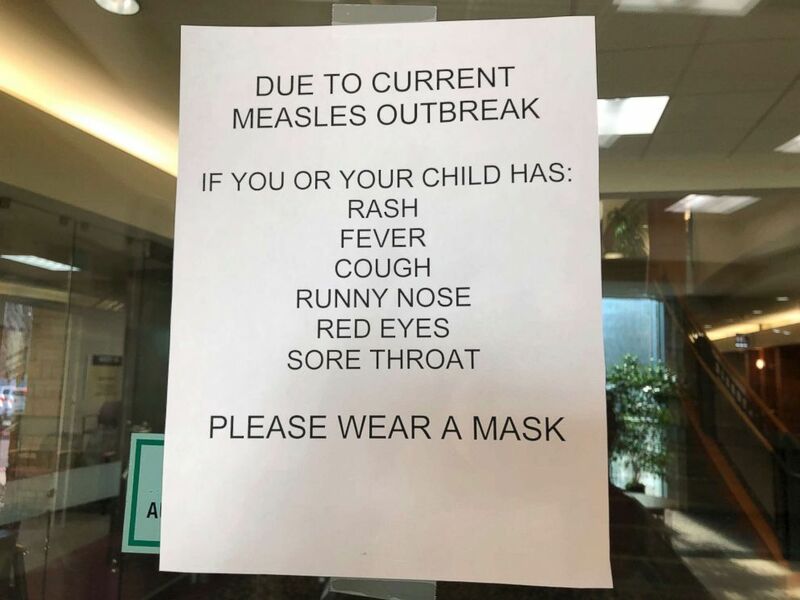 "We do right now, but once this outbreak is taken care of, we'll have no more measles in the U.S."
"Unfortunately there's lots of parts of the world that have lots of measles," Salmon said. Salmon stressed that the foreign individuals involved in U.S. measles outbreaks are "not illegal immigrants," but rather "it's people who have enough wealth to travel." "There's been ongoing measles outbreaks in Europe for years and it's largely because of vaccine refusal," he said. "It's my hope that what's happening in Europe does not happen here," Salmon said.